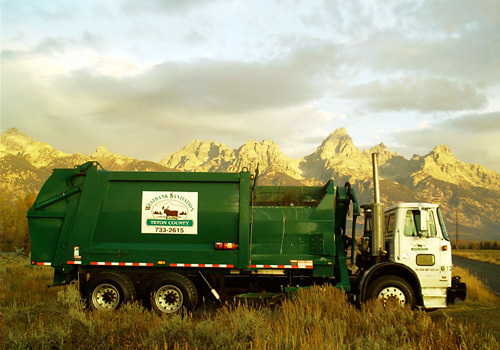 Westbank Sanitation proudly provides top quality residential garbage removal in Lincoln, Sublette and Teton County, WY. Call 307-733-2615 to start residential trash service for your home. And, from May 1 - October 31, residential yard waste service is available in most of Teton County. To sign up contact us online or call 307-733-2615. Weekly residential garbage collection is performed on Monday through Friday. Visit the Schedule page to enter your address and view your schedule. Please have your garbage container at the curb by 7am on the day it's to be picked up. Place your Westbank trash cart at the curb facing it towards the street, and make sure it is at least 4 feet away from another cart and 6 feet away from vehicles. To prevent littering, please secure your residential trash in bags and keep the lid closed at all times. *The Bear Resistant residential trash carts are steel-reinforced above, under and around the cart body and lid. The latch box under the bib prevents bears and other animals from getting into the residential trash container. How often do Westbank Sanitation residential customers get billed? How will you let me know if weather will impact residential trash pickup for Western Wyoming? This website has an ALERT field that appears at the top of every page. We will post weather service delays in this area. What do I do with extra trash? If bagged and placed out next to the cart, the driver will pick it up and you will be charged a minimal bag fee. Or, call 307-733-2615 by noon the business day before your pick up day to learn your options and the cost. If you are going on vacation for more than a month, call and we will temporarily suspend your service.